HOT DEALS EVERY MONDAY - THURSDAY! Save $50 With Our Weekday Specials! GREAT LAKES FISHING AVENTURES FOR EVERYONE! One of the greatest assets of the Midwest are the Great Lakes and Lake Michigan is right at our door. Lake Michigan is home to offshore fishing without heading to the ocean; our game fish include Coho, Kings, Steelhead, Lake Trout and Brown Trout. 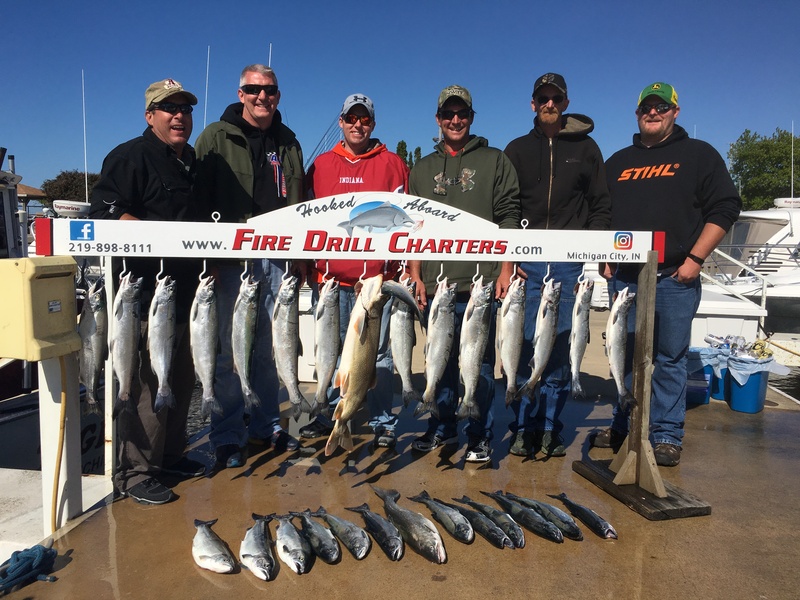 If you enjoy fishing or want to get someone you know to love fishing, you can’t go wrong with a trip on Fire Drill. We’ve had fisherman of all ages and abilities. We put you on the fish and you reel them in – some with a fight – but we’ll be right by your side to help you bring them aboard. There’s nothing better than spending a day on the water catching fish and building memories with the family. We pride ourselves in running family friendly charters that can accommodate just about any age range. Make a memory today! Fishing is a fun option for a corporate outing or family reunion. While we can only have six passengers; we work closely with our fellow captains in the port and can do multiple boat trips. Challenge the other boat to see who ends up with the most fish. We provide everything you need for a day of fishing – the rods, the reels, the bait, cleaning of the fish and we even have fishing licenses on the boat. Fishing is what we do for a living so we make sure to have the most well-maintained tackle on board and the lures that get the bite. DON'T MISS OUT THIS SEASON! Book Your Great Lakes Fishing Adventure Today!